Are you falling victim to boring employee communications? Whether communicating to a workforce of three hundred, three thousand, or three hundred thousand, you need to make sure your message is wrapped in an exciting employee communication idea. Gone are the days when sending a memo around the office would grab your employees’ interest. You have so much competition when vying for the attention of your employees — emails from colleagues, retailers, publications flood inboxes by the minute and important information is easily lost amongst all of the 'advertising' that employees are bombarded with each day. Now, you need your employee communications to pop. Your messages need to cut through everything else which will take the attention of your employees away. Every piece of employee communications we send out is as a chance to connect with people in the business and reinforce a positive culture, so don't be afraid to reach your people where they are. It puts the information in front of the most relevant audience. It sends home a 'good news story' to the family and cements the company's Employee Value Proposition while promoting an inclusive, workplace culture. By putting employees — and their families — first, this company gets higher engagement on their corporate discounts program. There’s a golden rule with employee communications of “repeat your message three times to make it stick.” Repetition alone can get a bit tedious – think of the toddler who constantly asks for the same thing – so the fun really comes in finding different ways you can deliver your message. 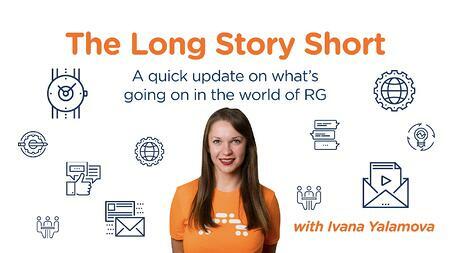 At RG, we’re fortunate to have a CEO, Doug, who’s really connected to our business and each week, he writes a blog post to make announcements, share business results, and summarise his thoughts. Whilst Doug’s blog is well-read, it's a tough feat to gather 100% engagement each and every week. Cue our video content. Ivana is part of our Internal Comms Team and has a weekly video segment on our own employee communications platform. Called “The Long Story Short,” it’s another employee communication idea which allows those who would rather watch a video than read a blog post to digest what’s happening in the business. Ivana also works in our Plovdiv office in Bulgaria, which is our biggest in the company, and having her as the face on our video content gives that area of the business a more familiar figure to relate to. Another member of our Internal Comms Team who's a frequent blog contributor, Cat Lewis, was tasked with writing about why effective employee communications are important. And in a boundary pushing style true to effective employee communications, Catrin stayed away from writing a simple blog post – opting instead to write a fairytale. QR codes have had a mixed reception in recent years and have more or less fallen out of fashion now. In case you don't know what QR codes are, they’re the small boxes made up of black and white squares which you can scan with your smartphone’s camera. I’ve mainly recommended against them due to you needing to install an additional app to scan, and having an extra step in your employee communications will instantly put a barrier up for even the most engaged. But recently, Facebook added a QR code scanning functionality to their Messenger app. And with Messenger having 1.2 billion daily active users, it’s highly likely that a large amount of your workforce do too. With this in mind, we put a QR code on posters which clients used to promote our employee discounts app to their workforce. Employees would scan the QR code through Messenger and a simple, friendly chatbot would guide them through how to install the employee discount app, depending on their chosen smartphone. This bot can also be set up to send reminders, and triggers if there is a certain seasonal message, engaging your employee on a format that is completely familiar to them. These are only a few examples of the ways in which we and our clients are on a quest to make their employee communications more fun, and the best thing you can do is make sure you capture the personality of your business when you’re communicating with your people. You know your workforce better than anyone else and know what makes them tick. Tap into that, tailor your communication ideas to it, sprinkle your personal touch, and you’ll be onto a winner. If you’d like to talk about employee communication ideas or employee engagement in general, please, get in touch with me and I’ll see how I can help. Kameel Martin is a Senior Client Success Manager for a wide range of businesses. She always has communications and marketing on her mind, and loves to share knowledge with anyone interested in improving employee engagement!